A pretty cool prison escape movie that hits you with the emotional stuff, even if it does go on a little too long. The Next Three Days in a way reminds me a lot of the russell crowe movie, proof of life. in that movie, crowe’s character was a specialist called in to help a guy escape from a prison camp where he was being held hostage. the whole movie was about leading up to the escape, and then the actual escape happened at the end. and there was one woman in the movie who crowe ended up falling for (meg ryan). it didn’t matter that she was the wife of the guy who was kidnapped, she was apparently the only woman around, and so crowe and her had a steamy affair. luckily, the next three days is a little better than that. but it sure does have a lot of similarities. crowe is again trying to help someone escape from a prison situation. this time it’s his wife. there is again only one real female character and so crowe is with her for the entire movie, never thinking about cheating or seeing someone else. and again the entire movie is basically a setup for the escape which will be the climax and is saved for the end of the film. but the next three days is a much better movie than proof of life is. maybe that’s because the director is paul haggis, a guy who directed the best picture winner crash about five years earlier, and clearly has talent. proof of life, on the other hand, was made by an aging director whose glory days were long behind him (taylor hackford, best known for an officer and a gentleman). haggis might have broke out with crash, but that movie just showed he was a name to watch out for in the future. the problem with paul haggis is that his movies tend to drag on and be a little slow. they can be too detail oriented. now crash avoided this problem by having so many different plots and characters and situations. but i bet haggis’ follow up to crash, in the valley of elah, had them, and the next three days certainly has them. after all, the entire movie is really just about crowe’s character, john, trying to make a plan to get his wife lara, (Elizabeth banks) out of prison. what works about the movie is that crowe is such a talented actor and you believe his commitment to this thing. he doesn’t want to go beyond the law, but he isn’t given any choice. his wife is arrested for murder and found guilty. she was in the parking lot when the victim was murdered, had a fight with the victim in the office upstairs right before, and has the victim’s blood on her jacket. there’s just too much evidence stacked up against her. but john doesn’t believe she did it. one thing fantastic about this movie is that it keeps us guessing until the end. we never really know the truth until the final moments of the film, and that’s pretty cool since the movie raises the possibility that maybe lara did actually commit this murder. at one point when she and john are alone, she even gives him reason to believe that maybe she isn’t innocent after all. the main problem with the movie is that it’s very one-noted. the entire film is about john’s plan to get lara out. there’s no other plot going on here. and to make matters worse, it’s a pretty long film. i could see this premise working if the movie was somewhat short, but to drag it out is just ridiculous. still, we are in good hands with this director and haggis knows how to keep us interested at all times. the attention that this movie goes into is pretty amazing. if john is going to do this, then he needs to have everything down to a science. and so he sets up a huge bulletin board wall in his house and starts tacking up as much information as he can get about how to stage a prison escape. it’s like an episode of the wire or any other detectives show where the police sit around tacking up as many connections as they can find onto a bulletin board. john also consults with damon pennington, (liam neeson), the author of a book on how to escape from prison. pennington escaped from many different prisons numerous times. he’s like the sean connerey character of the rock. and like in that movie, pennington is brought in for consultation. it’s great having neeson in the role, but my problem here is that he’s only in one scene. we could have used more of him. especially since the trailers work so hard to promote that he’s in the movie. he should have had a role like jamie fox’s in horrible bosses, playing the consultant who the guys need to keep checking back with every now and again. 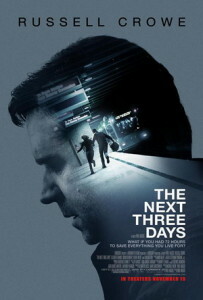 the next three days is a good movie because it is interesting and entertaining and keeps you wondering. it also keeps you anticipating the excitement that is to come when the prison break finally happens. but the movie is not without flaw. it is too long and too devoted to a single plot line. we could have used at least one other small plot happening on the side. olivia wilde is in the movie, for example, playing a neighbor of john’s, and maybe john should have had an affair with her. could you blame him? his wife is in prison for years. i don’t even think his wife would have blamed him. it could have been interesting and discussion worthy. but this movie sticks to it’s single plot and adds nothing in for flavor and that ends up being it’s biggest problem.